US Trump Far-Right Meets French Far-Right. Steve Bannon, the former Trump strategist and “alt-right” publisher, capped a European tour this week by urging a gathering of France’s struggling National Front party to stand by their populist guns. 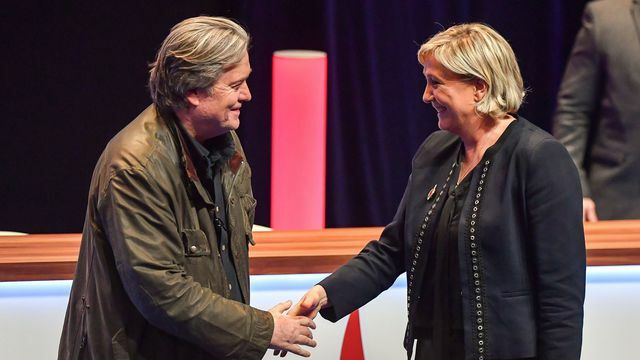 Steve Bannon, US President Donald Trump‘s one-time trusted adviser, addressed the far-right Front National party in France and said “history is on our side”. The former editor of right-leaning Breitbart News had helped the President shape his “America First” agenda and met with National Front leader Marine Le Pen, known for her controversial anti-immigration views. “You’re part of a worldwide movement bigger than France, bigger than Italy,” he told a cheering crowd in Lille, France for the party’s convention. Ms Le Pen said inviting Mr Bannon to speak was important because he was “the architect of Donald Trump’s victory”. She also cited his views on giving regular people “power, which in his mind and mine, too, has been practically illegally captured by the elite”. Le Monde cites the far-right Party’s spokesman Sébastien Chenu praising Trump, the “incarnation of the rejection of the Establishment, the European Union and the “political-media system”. le porte-parole du FN, Sébastien Chenu a de son côté estimé samedi matin sur France Inter que l’ex-conseiller de Donald Trump « incarne pour nous le rejet de l’establishment, de l’Union européenne [UE], du “système” politico-médiatique ». As a measure of the gauge Bannon’s organ, Breitbart, has on French politics their strapline on the meeting was the following. Rumoured, as in their publicly announced official intention for months and months and months. The fanfare over Bannon is a distraction from the glaring paradox of this otherwise largely technical party convention, one poised to reinstate Marine Le Pen as leader even as faith in her leadership has indisputably waned. She has looked to stir up excitement for the party name change she will suggest on stage Sunday, a rebranding set to put the 49-year-old’s indelible stamp on a party she took over in 2011 from her rabble-rousing father, Jean-Marie Le Pen, who founded it in 1972. Hellbent on “de-demonising” the National Front in the public eye, Marine Le Pen made a show of snubbing the shaved-head and bomber-jacket types fond of her father and touting an economic programme that vilified the Euro currency and advocated a state that protects the vulnerable (or at least the ones who hold French passports). Reaping the rewards of nascent respectability in one election after another, she built a stable of elected officials at nearly every level of government. Advocates claim that changing the ostensibly sulphurous name is a necessary next step, the last obstacle to political alliances that would finally carry the FN to power. But members seem sceptical. According to the party’s own unverifiable numbers, only 52 percent of members who bothered to return a questionnaire approve of calling the party anything else. As Le Monde reported a few days ago Marine Le Pen’s popularity is in steep decline, “Une image en chute libre”. Volontaire pour 80 % des sondés en février 2017, elle ne l’est plus que pour 66 %. Sa capacité à prendre des décisions s’est effondrée de 69 % à 49 %. Les Français ne sont plus que 40 % (en baisse de 9 points depuis un an) à estimer qu’elle comprend leurs problèmes. Déjà érodée depuis 2016, sa capacité à rassembler au-delà de son camp ne lui est plus reconnue que par 30 % des sondés (en baisse de 12 points). Elle n’était déjà jugée sympathique et chaleureuse, il y a un an, que par 35 % des personnes interrogées ; elles ne sont plus que 25 %. Enfin, 16 % seulement des sondés (contre 24 % il y a un an) considèrent qu’elle ferait une bonne présidente de la République. From being considered “Decisive” by 80% of those polled in February 2017, she has dropped to 66%. The assessment of her ability to take decisions has fallen from 69% to 49%. There is a drop of 9 points, to 40% who consider she grasps their problems. Eroding from 2016 downwards, the cap to appeal beyond her own side has gone down 12 points to 30%/ She was judged warm and kind a year ago by 30% of the respondents, this stands now at 25%. Finally, only 16% (as opposed to 24% a year back) think she would make a good |President of the Republic. Some might consider this a good score for an acerbic apprentice dictator, but it is unlikely to please her party activists. More reporting (Libération): Steve Bannon, un air de populisme américain au congrès du Front national. This notes the surprise at the invitation, and the not entirely happy reaction of some party activists, who rushed to declare (in view one imagines of Trump’s popularity in France) that there was no formal “alliance” between the FN and Breitbart. Meanwhile the UK far-right is also building links with Bannon. « The Left and Solidarity with East Ghouta.